New Sudoku application revolutionizes the Android Market. There is apparently a new Sudoku application available for Android devices which is causing people to go crazy in the Android Market. The developers of the application claim to have built some new technology to recognize the human handwriting so players can enter their own numbers with either their finger, or even a stylus, and the application will insert the number in the appropriate cell in the Sudoku map. Rumor says that iOS guys are jealous because the application is not yet ready for IPhone or IPad. We have had access to the source to confirm if this is indeed going to happen. SwanApps. 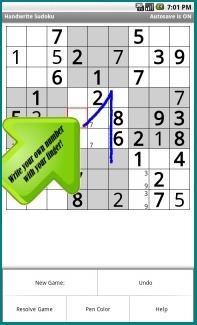 Is it true that this app includes all the usual stuff in Sudoku games? D.A. Yes, multiple difficulties, unlimited maps, Undo, Pencil Marks, Auto-Save, Resolve Game, a comprehensive Help section and much more. SwanApps. So, what is new? More games, video players, utilities, enhanced reality applications; the possibilities of this technology are endless. Stay tuned for more Swan Apps in the near future.